Life with Giggles: A new Sonic has opened up! For years I have seen tons of Sonic commercials on TV. One problem though, there was never a Sonic within a reasonable distance to our area. Now, there have been two that opened in our area within a half hour to 40 minute drive. The closest one to us has been open I would say about a month, but we haven't had a chance to go because it's been so packed! The other day, Mr. Newlywed Giggle and I had off on Monday and we were out during the day. We passed the Sonic and decided to see if we can have a chance to try it out. We got DENIED when we entered the driveway from the cops (yes, cops are permanently standing there to direct traffic). They didn't want the line spilling out onto the highway so we got turned away. Last night, we saw Harry Potter and got out of the movies around 1:30AM. We thought we would have a good chance of being able to finally try it out. NOPE, we were wrong! The TWO lines that form into one were almost at the highway's entrance. Unbelievable how packed it was even at that time in the morning. Someday we might get the chance to try it out... someday. Have you ever tried Sonic? Is it really good? I think we all have been teased for so long with their commercials that we are in a frenzy! I can't believe it! We have Sonics all over the place. Honestly, it was cool to begin with because of the whole drive-in, carhop thing, but we've gotten over it. They do have some dang good chili cheese dogs (The Coney) and cheddar bites though. I'll tell you they don't cook their grilled cheeses sandwiches long enough because they're never crispy. Oh, and we NEVER leave without a lemon-berry slushie. Hope you get in soon, just to settle your curiosity. 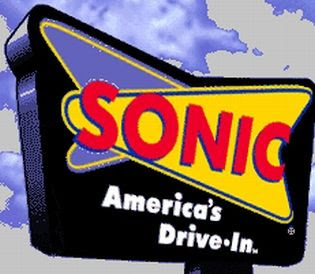 You know, we see those commercials all the time but I have never been to a Sonic. I sure if we got over to Portland or Seattle there are some but no where near where we are. If you ever get a chance to try it let me know if it lives up to the hype.